Gulf Stream Archives - Bob Irsay Irrigation Design, Inc.
Beautify your property this year with low-voltage landscape lighting! Durable, high-quality LED lights, which come in a variety of colors, can make your yard stand out from your neighbors, add to your curb appeal and accentuate palm trees, oaks, bushes, flowers and other landscaping. Call Bob Irsay Irrigation Design, Inc. at (561) 734-3997 to get a free quote for a landscape lighting palm beach system. Property owners and homeowners can make their lawns and landscapes “pop” with an assortment of colored lights and different finishes for lighting fixtures. 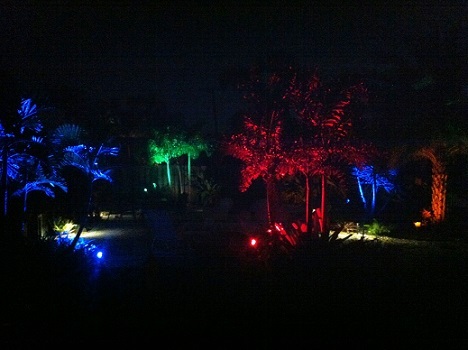 Mix and match colors such as blue, orange, white, red and green in your new landscape lighting west palm beach system. The lighting fixtures come in finishes such as bronze, matte black and stainless steel. Customers can choose different colors for LED lights based upon which trees and plants are lit up. Call today to schedule a free consultation for a lighting installation. We’ll evaluate your property and walk the property with you to get an idea of how you would like to illuminate your landscape, such as well lights and up-lights. We will then offer you a detailed proposal to perform the work. We work in Palm Beach County and Broward County. We install lighting systems in Boca Raton, Lake Worth, Jupiter, Wellington, Palm Beach Gardens, Ocean Ridge, Manalapan, Gulf Stream, Atlantis, Delray Beach, Boynton Beach, Greenacres, Highland Beach, West Palm Beach, Lantana and other locations. Enhance the appearance of your property in the Palm Beaches with a landscape lighting system installed by Bob Irsay Irrigation Design, and take pride in how your yard looks! Please visit our gallery for examples of some of our landscape lighting jobs. This entry was posted in Blog, Landscape Lighting Palm Beach and tagged (561) 734-3997, accentuate palm trees, add to your curb appeal, assortment of colored lights, Atlantis, beautify your property, blue, Boca Raton, Boynton Beach, bronze, Broward County, bushes, Delray Beach, flowers, free consultation, free quote, green, Greenacres, Gulf Stream, Highland Beach, illuminate your landscape, Jupiter, Lake Worth, landscape lighting palm beach, landscape lighting system, landscape lighting west palm beach, landscaping, Lantana, LED lights, lighting fixtures, lighting installation, lighting systems, low-voltage landscape lighting, make your yard stand out, Manalapan, matte black, oaks, Ocean Ridge, orange, Palm Beach County, Palm Beach Gardens, plants, red, stainless steel, take pride in how your yard looks, the Palm Beaches, trees, up-lights, variety of colors, well lights, Wellington, West Palm Beach, white on 02/02/2016 by jason.